Let me start this post by congratulating new Labour MP for Corby, Andy Sawford – who does come up in this post, and Labour’s 13 new Police and Crime Commissioners, who don’t. It amazes me that any PCCs were elected from the party that has slashed police numbers and devastated their morale, but I guess you can fool some of the people some of the time, and some are too blinkered to see what’s going on. Politics is a funny old game. I’d also like to recommend anyone who’s interested to start listening to some Radio 4 shows on politics: Today in Parliament, Weekly Parliamentary Review and Week in Westminster, which you can get here. They can only be summary shows, but they do touch on things that you can then follow up on later yourself to find more. This article, and others, have started like that for me. An informed people is dangerous to despicable governments. Now, to the main event. I’ve written often on how this government has lied in Parliament – on economics, on employment, on the NHS, and many other things. But it’s relatively rare to find them blatantly lying to their own MPs – perhaps because most of the questions from the Tory back-benches on most issues (except the EU) tend to be tame, ‘tee-up’ questions designed to allow ministers to posture about the issue in question. The nub of the points that I want to make is that local people simply will not put up with any prospect whatsoever of any downgrade to the accident and emergency facilities or the maternity wing at Kettering general hospital. Those are two highly valued, much prized departments and whoever plans the future of the hospital simply must not downgrade those two vital facilities, because they do a fantastic job in very difficult circumstances. I reassure my hon. Friend that A and E and maternity services at Kettering hospital are safe. The Prime Minister has put that clearly on the record, and I confirm it again today. Mr Hollobone’s concerns stemmed from a leaked report by Healthier Together which outlined a range of options for cuts to services in the region, top of which was a reduction of 515 beds – 78% of its total – at KGH. The 2nd highest-ranked option would involve a reduction of 229 beds, also at KGH. If facing a massive reduction in beds in both of the 2 most-preferred options is ‘safe’, then ‘at risk’ must be something indeed. The regions 5 hospitals are expected to save £48m, so the cuts are going to fall somewhere, and Kettering is both first and second in the list of ways to achieve it. Whatever the Minister says, is it not a fact that in the official documents, the “best” option is downgrading Kettering general hospital’s accident and emergency, maternity, children’s and acute services, and cutting a significant number of beds? How can he say that those services are safe? The hon. Lady is turning this into a political debate, which is exactly what the Labour candidate in the Corby by-election has done. That is completely wrong and what she says is not true—it is scaremongering. There are no official documents at the moment because there is no consultation of that nature at the moment. There is no NHS consultation. Perhaps she should focus more on Nottingham, which is where her constituency is. I am sure her constituents would rather she were on the train back to hold a constituency surgery, which is what I will be doing after this debate, rather than making silly, ill-founded and mistaken political points about matters that bear no resemblance to her constituents’ concerns. I hope she will draw a lesson from this. I know she has been put up to making that point, but this is not the time. In other words, he starts with ‘it’s none of your business and you have better things to be doing than being here challenging me’. A shade short of ‘calm down, dear’, but incredibly smug and condescending. He then says that, because there is no ‘consultation’ at the moment, there are no ‘official documents’, but this is patent nonsense. In this setting, a ‘consultation’ is a discussion with staff and public about implementing decisions that have already been taken, about the impact of, and best route to achieve, those decisions. But the fact that the leaked document lists options rather than firm decisions does not in any way prevent the document being ‘official’. On the basis that no decisions have been taken yet, Poulter accuses Labour of ‘scaremongering’. But to any right-thinking person it’s perfectly obvious that such documents and their contents are absolutely of public interest exactly because they might lead to changes that will massive impact the local populace. Publicising and opposing those options is exactly the job of local politicians – it’s their duty, not scaremongering. The hon. Lady’s point was ill-founded. There is no consultation active in Kettering at the moment. There were some leaked documents about a range of options, which incorrectly set a number of hares running. The Labour candidate in the Corby by-election has already retracted his position. My hon. Friend has held the debate today because of that scaremongering, and because he is such a strong advocate for the needs of his patients in Kettering and his hospital. He wants to reassure them that Kettering hospital has a viable future. ‘Consultation’ and ‘a viable future’ are meaningless words and phrases that don’t in any way say that the cuts that Mr Hollobone fears won’t happen. But Andy Sawford, then Labour candidate and now newly-elected MP for Corby, who highlighted the proposed cuts, has not ‘retracted his position’. Our Hospital is under threat. 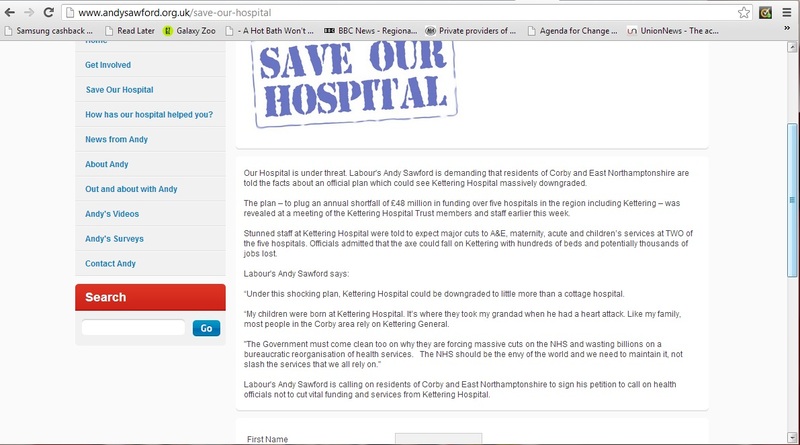 Labour’s Andy Sawford is demanding that residents of Corby and East Northamptonshire are told the facts about an official plan which could see Kettering Hospital massively downgraded. The plan – to plug an annual shortfall of £48 million in funding over five hospitals in the region including Kettering – was revealed at a meeting of the Kettering Hospital Trust members and staff earlier this week. Stunned staff at Kettering Hospital were told to expect major cuts to A&E, maternity, acute and children’s services at TWO of the five hospitals. Officials admitted that the axe could fall on Kettering with hundreds of beds and potentially thousands of jobs lost. “Under this shocking plan, Kettering Hospital could be downgraded to little more than a cottage hospital. Does that sound like a retraction to you? And bear in mind that, while Poulter was responding to an intervention from a Labour MP, Poulter was still answering the question from his fellow Tory, Philip Hollobone. In my hon. Friend’s region there are considerable distances between the hospitals involved and, if at some point in the future a consultation opened up, those greater travelling distances between hospitals would be taken into account as it may impinge on patient choice. I don’t know much about Philip Hollobone beyond this exchange, but he appears to be prepared to challenge his own government for the sake of his constituents, and that’s extremely commendable. His principled stand has exposed the complete moral bankruptcy of his front benches, showing them to be willing to misdirect, mislead and even lie to one of their own MPs. His stand has also set an example that MPs everywhere, of whatever party, should be copying. In stating that his constituents will ‘simply not put up with’ an attack on their local health facilities, Hollobone is correctly identifying a deep resource of local passion and determination that will exist in every community to defend its health resources and its hard-working health staff. The scandal of this government’s attack on the NHS is compounded by the complicity or passivity of local politicians and NHS Trust executives who have either remained silent or – as in the case of the Trusts in the South-West and North-East among others – have enthusiastically collaborated with the government in its drive to slash health provision for ordinary people. What we need to see and should be seeing is MPs, local councillors, health executives and unions uniting and flatly refusing to accept that health spending, staffing levels and services need to be cut, rather than looking for ways to achieve the government’s aims for it. Every person who cares about the NHS, whether they work in it or have political responsibilities or not, should be fighting this government’s attack and saying, clearly, simply and emphatically: NO! You don’t get to do that in our region, on our watch. If necessary coming out onto the streets to protest and to blockade until the government admits that it has no mandate for the changes it is making out of ideological desire rather than genuine necessity. Let’s tell our MPs – of whatever party – that we won’t accept anything less than all-out resistance – and this lying, unprincipled government that we’ve seen its game and we’re not having it. ← Should Labour take Britain out of Europe? Why was hunt given the health sec job? He hates the NHS he rigged it so branson got contracts.. Exactly because he hates it and has demonstrated his willingness to co-operate with wealth via News International etc. I once worked in Kettering Hospital, it is a nonsense to downgrade it. Hopefully the public will rise up and rebel as they did with the Poll Tax and force a General Election. You must dig out a good essay from the socialist Bob Holman in the Sunday Herald about the serious social divisions and poverty that are being created.